The beverage giant will make its new home alongside Jerry Jones and the Dallas Cowboys at The Star. 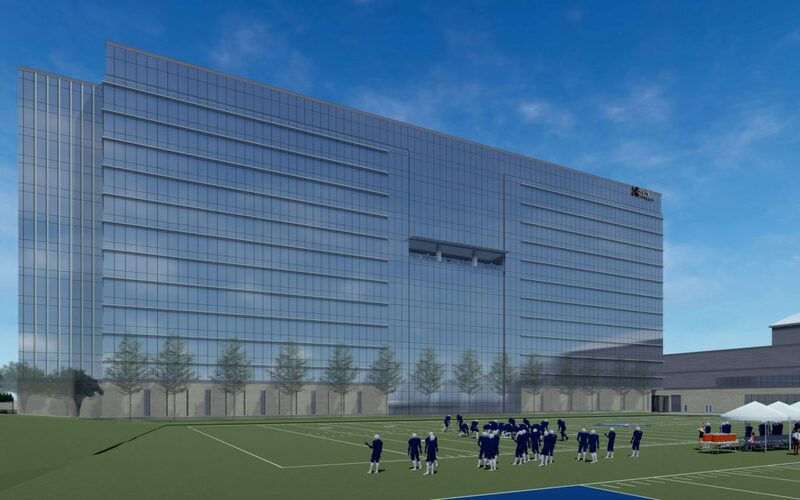 The ink has dried on Keurig Dr Pepper’s big deal for a 350,000 square-foot build-to-suit at The Star, a 91-acre mixed-use campus anchored by the Dallas Cowboys’ world headquarters and training facility in Frisco. Bob Gamgort, chairman and CEO of Keurig Dr Pepper, said the new facility represents an exciting upgrade for its Lone Star seat of power. “The new location at The Star in Frisco will provide a state-of the-art work environment and exciting amenities that will energize our employees and enable us to attract top talent in the area,” he said. Keurig and Dr Pepper merged operations in 2018. The $11 billion company has a second headquarters in Burlington, Massachusetts, and employs more than 25,000 in 120 offices, manufacturing plants, warehouses, and distribution centers across North America. Blue Star Land, Jerry Jones’ real estate firm and developer of The Star, tapped HKS Inc. to design the new Frisco headquarters. It was represented in lease negotiations by Worthey Wiles and Jake Young of Lincoln Property Co.
Keurig Dr Pepper was represented by Jeff Ellerman, Seth Kelly, John Ellerman, and Robert Blount of CBRE. The company selected Corgan to oversee interior design of its new space. Securing a Fortune 500 corporate resident is another big win for Frisco, which, in the eleventh hour of 2018 snagged a new headquarters for PGA of America. The city’s mayor, Jeff Cheney, said Frisco has emerged as one of the top corporate relocation destinations in the country: “With this move, Keurig Dr Pepper will have a direct impact on our city’s corporate landscape for many years to come. © LPC Dallas. All rights reserved.